Travel is the fourth theme of the Green-Schools programme. The Travel theme is funded by the Department of Transport, Tourism and Sport and supported by the National Transport Authority. 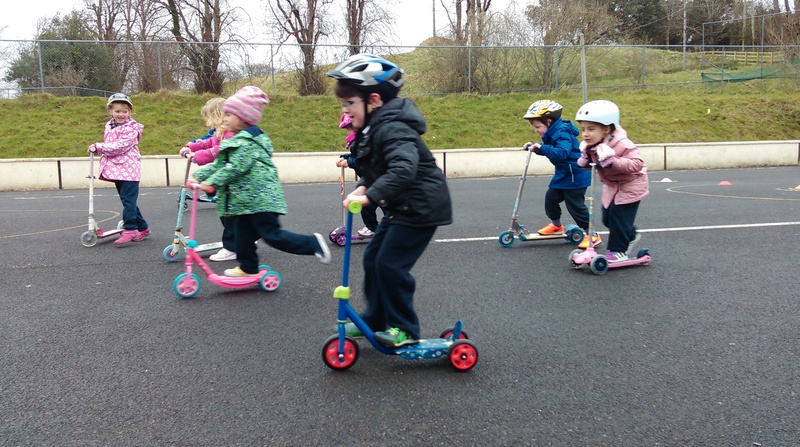 While creating their Action Plan participating schools set Travel targets, with the ultimate aim of increasing the number of pupils walking, cycling, scooting, carpooling, using public transport or using park ‘n’ stride instead of the private car on the school run. By promoting these sustainable transport modes, schools will also improve pupils’ safety, health and fitness. The journey to school is an ideal way for children to take part in regular physical activity, to interact with their peers, and to develop the road sense children need as pedestrians and cyclists. Alternative modes of transport also improve children’s alertness. The schools will also lessen their overall impact on the environment, by reducing emissions and pollution. Green-Schools Travel was rolled out nationally in September 2008 after a successful pilot programme in the Greater Dublin area. Since then we have worked, or are working, with over 1400 schools around the country to promote sustainable travel to school. Green-Schools have dedicated Travel Officers throughout the country who work closely with schools to support them through the 7 Step process of the Travel theme. These officers offer assistance with conducting your Environmental Review; beginning your Action Plan; hosting Days of Action and can help you apply for cycle training and parking for your school. View a list of schools invited to participate in the Green-Schools Travel theme for the 2018/2018 academic year. Children’s Traffic Club: Fun and interactive road safety website (UK) suitable for junior and senior infants. Sustrans: UK charity enabling people to travel by foot, bike or public transport every day.